The Malayan weasel (Mustela nudipes) is a species of weasel. 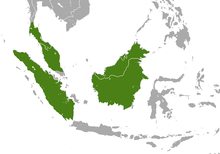 It lives in Brunei, Indonesia, Malaysia, and Thailand: on the islands of Sumatra and Borneo and the southern half of the Malay Peninsula. It is rated "Least Concern" by the IUCN Red List. Malayan weasels have a body length of 12–14 inches (30–36 cm) and a tail length of 9.4–10.2 inches (24–26 cm). The body is reddish-brown to grayish-white. The head is a much lighter color than the rest of the body. There is no hair on the soles of the feet around the pads. Not much is known about its breeding habits, but a litter of four has been recorded.